Samsung on Thursday unveiled two new dual-SIM smartphones, the Galaxy Y Duos and the Galaxy Y Pro Duos. A phone with two SIM card slots offers a number of benefits; it’s perfect for two people hoping to share a single phone in emerging markets, but it’s also great for business travelers that want to use one account for personal matters and a second as a business line. The Galaxy Y Duos runs Android 2.3 (Gingerbread) and has a processor clocked at 832MHz and a 3-megapixel camera. 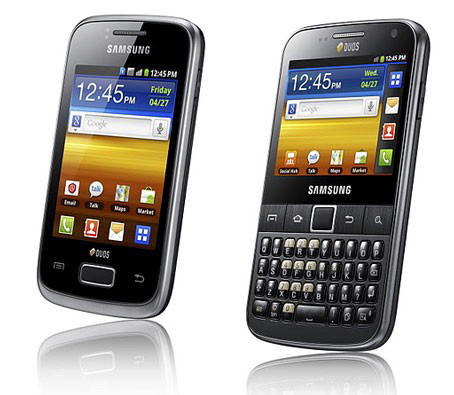 The Galaxy Y Pro Duos offers similar specs but has a smaller 2.6-inch display and a full QWERTY keyboard. Both phones will initially launch in Russia. The Galaxy Y Duos will then roll out into Europe, CIS, Latin America, Southeast and Southwest Asia, the Middle East, Africa and China. The Galaxy Y Pro Duos will launch in Europe, CIS, Latin America, Southwest Asia, the Middle East and Africa. Samsung’s full press release follows after the break.